It was great to see the Dominion Post actually use some of its reporters to explore some of the local issues in the Weekend, with a two whole (almost) full pages on developments on the Wellington waterfront. 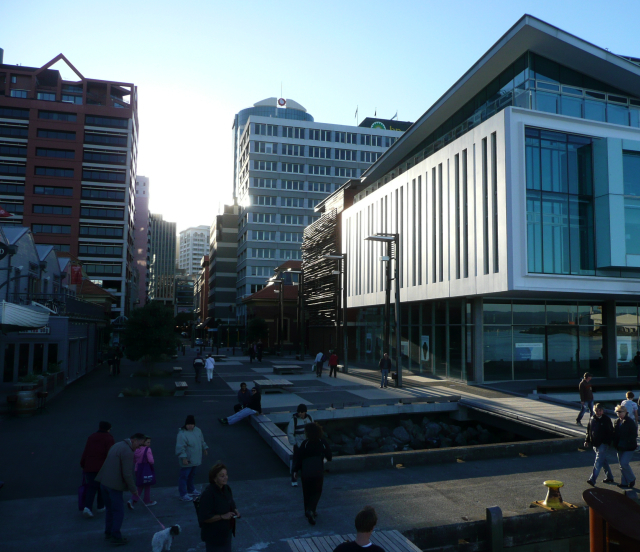 The WCC is currently in the throes of evaluating further submissions on Variation 11 (regarding the Waterfront), which, rather confusingly to me, comes about 7 years after the Variation 17 debacle erupted onto Wellington’s radar. 11 comes before 7? How does that work? Does WCC have a time machine, or did they helpfully leave an empty slot in the schedule? Or do they just count backwards towards zero? And what happens then? Does the universe explode? Implode? Its just all so perplexing. Now, an award winning building is pretty special – especially if it hasn’t even been built yet. Its hard enough to build a building in real life, let alone virtually, and to win an award for that before it’s built: Someone must be very clever. Perhaps they are going to find one off-shore and ship it in to the site, south of the Meridian building. Very clever indeed. And even more so, as I thought there was a pub in between – the Loaded Hog, I believe. Here’s a picture of the ‘car park’ south of Meridian. Can you see room for an award winning building between the Hog and the Meridian? Me neither. I can’t even find room for a car park there, and suspect that instead, the DomPost must be talking of the area North of Meridian – where, as we all know, sites 8, 9, and 10 are situated. Bit of a let-down there, except of course wonderful to hear that Athfield Architect’s 3 proposed buildings have already won awards. Still: the DomPost wouldn’t be the paper it is today without a few mistakes. But enough bitching about that – it’s simple enough to get north and south muddled up. Just like day and night really. What I’m more intrigued about lies many miles away, in the fog-bound Queen city. For reasons that completely escape me, a couple of local body governmental bodies have bought Queens Wharf up there for $20 million or so – even though they already owned it. And hear me out – what exactly are they going to do with it? Apparently the plan is for it to become a “party zone” for the Rugby World Cup. Now I’m not a frequent flier, so my geography may be a little rusty, but I still have Google-Earth and can figure out a few things like: the stadium is still going to be in Mt Eden, but the party is going to be at the bottom of Queen St. There is a couple of old sheds already on the Queens Wharf too. Not rich old beauties like we have in Wellington, with a row of old brick warehouses called exotic names like Shed 11 and Shed 13. No, the sheds in Auckland are just plain sheds, barely worthy of keeping. But the Jafas are going to keep the sheds, and spend up to $80m in total doing them up as a temporary party zone. Despite this being virtually next door to the existing Viaduct Basin party zone. The words ‘crazy’ have been mentioned. Whatever. I don’t mind them spending their own money on their own crazy schemes. But isn’t the whole thing crazy? While its true that Auckland will hold the final, and a few other games, the rest of the World Cup games will be spread around the country. Wellington will be holding one of the semis. Dunedin, if it builds its stadium, will be doing likewise. And certainly Christchurch has a stadium ready to go and will hold matches there. Auckland still has to actually rebuild their stadium. But nowhere else in NZ do they have to spend that kind of money just to build a party zone, for essentially the last 2 hours of the whole World Cup. The waterfront is such an easy fix. Allow some privatisation with strong covenants. I’d like to see the southbound lane of Customhouse and Jervois Quays pedestrianised. The raised Frank Kitts area is actually great – it could do with a redesign, but leave it raised and have shops along the three frontages. The only real problem I have is the Events Centre (providing the development north of Meridian is going ahead… though 2012 seems a long time) – that’s an area that should be privatised with strong covenants. It’s private now (carparks are open space, but they’re not really), so it wouldn’t be a net loss. It’s about creating valuable, quality public space, rather than just getting as much open space as possible. There’s plenty of open space in the country, but nobody goes there. >Now, an award winning building is pretty special – especially if it hasn�t even been built yet. You obviously haven’t seen Architecture NZ magazine. Most editions have a whole section devoted to showcasing several dozen architecture awards. I doubt if there is a house, shed, or dog kennel in the country that hasn’t won at least a couple of awards. As for the waterfront… The container terminal could be easily converted in to the country’s biggest prison. davidp – ouch. But sadly true. The standard of local awards from the NZIA has slipped pretty low in recent years. There were some shockers in the list last year. But the buildings and places at the top of the heap, that really win awards, they seem to be worthwhile. I’ve just been down to the newsagent to do some fish-related R&D. The latest edition of Architecture NZ has 19 different awards listed. Including one for Welly’s own Water Whirler. I’ve been past that bit of the waterfront hundreds of times and have never EVER seen the Whirler whirling. Is it broken? Or does the bloke with the tap turn it off when he sees me in the distance? The NZ Memorial at Hyde Park Corner also wins an award. IMHO it is a bit of a mess of a design, and I’m not sure why we’re so keen to decorate a wealthy place like London when they’re taking no steps to install street art in NZ cities. But, anyway, in my experience 19 awards in a single Architecture NZ edition is less than average. Often they break the awards down regionally, so they’re dishing out what feels like hundreds of different awards at a time. Given that the buildings were selected through the use of a competition, I guess they by definition must be ‘award winning’ in order to be built. Also, DavidP, where you currently based in london? Illd be interested in gathering more of your thoughts on the hyde corner memorial. Philip – was wondering where you had disappeared to. Yes please – more on Melbourne ! David P – you are such a harsh man. Yes, you’re right, the Arch NZ mag often does have a plethora of ‘award winners’ but think of the poor wee buggers on the submitting side. They spend 2 years designing some place, and getting all the relevant commissions and permissions, and then another year building it, and then they’re as proud as punch with the result. It then takes the wind clean out of their sails when they put the building up for an award and the jury don’t even give it a simple bottom tier award – this piece of architecture that they’ve just spent 3 years of their life on – rated as apparently worthless. Only the memories of those long cold lonely nights to keep them warm. Anyway – remember – those 19 awards in the latest edition – those are the supreme awards, the group that decides the best of the best. And with the new NZIA system, there is only one grand prize. This year won by the Wilson School for Special children in Takapuna. Well deserving of a great prize – finally architecture gives something back to the community. Oooh, and the water whirler? On the hour, for 10 minutes, at lunchtime and the afternoon. It’s the most magical thing ever when it is working. Dancing like a naughty little school boy. Fantastic. Especially by night. I’ll post some pictures for you one day. Philip>Also, DavidP, where you currently based in london? I’m not, I’m in Wellington. But I spotted it back in 2007 on a brief trip Up Over. I’d read about the Memorial previously, but just stumbled across it by chance one day. I thought it tried too hard to incorporate kiwiana, and came away looking a bit kitsch. But basically it just didn’t inspire me. I’m a photographer and I wandered around for several minutes trying to find an aspect that excited me, but didn’t find anything. That isn’t necessarily a bad thing… scenery like rainforests confuse me because they envelope you, rather than present something to draw the eye. But I think a monument should be a bit stronger. And then I couldn’t help wonder why British folk weren’t financing a monument in Wellington to commemorate the NZers who went to Europe twice last century to save them. Rather than NZers financing our monument in their city. Oh… and I’ll make sure to take a book down to the Whirler one afternoon and just wait until it starts. I’m hoping that it’ll be like the Bucket Fountain… craftily designed to drench passing tourists when Wellington’s wind does its thing. Re: Queens Wharf in Auckland. One entity sold it to another (or half of it). They might be related entities, but you just can’t start giving things away because you know the buyer – the taxman doesn’t like that. KLK – “why not stand outside in the spring night air and drink overpriced Heineken with other revellers while watching the games?” yes, but we’re unlikely to build anything new just for the matches. We’ll just get a couple of road closures again, maybe even the whole of Courtenay Place for a night or two. I fail to understand why, if there is a game on in Mt Eden, that another few thousand rugby fans get to have another $80m spent on them to undertake the afore mentioned Heine-quaffing. An Olympic village style development, where there are many games, and many venues grouped together, for a sustained period of time, makes some sense. What AKL is proposing: just doesn’t. A number of years ago the powers that be in the NZIA decided that the number of awards handed out needed to be increased. This was to do with gaining publicity and promoting architectural awareness in the community. The more people saw of architecture in the magazines and the newspapers the more exposure architects and architecture got. There was also probably some friendly competition with Master Builders which have there own awards and their own TV show also. This meant that (as DavidP pointed out above) lots of awards were given out and sometimes to not very deserving buildings. The awards have now been pared back so that only excellence is honoured. Just to clarify a few things – Auckland is hosting both semis. Wellington and Christchurch are hosting the quarter finals. Dunedin will only host pool matches – and those will be at Carisbrook unless the new stadium does get built in time, currently though unlikely. Christchurch’s stadium isn’t ready to go, but should be before the end of this year. Auckland’s stadium started the rebuilding quite a while ago and is on track. As for it being “the last 2 hours”, I imagine it’s intended for use throughout the entire tournament, such as every All Blacks game and events during the tournament such as concerts and of course parties. Maximus – I’m not sure you understand just what it is Auckland is proposing. Nothing new is being built on Queens Wharf specifically for RWC2011. The Wharf (and others near it) have long been sought to be reclaimed from the Ports Of Auckland for public access. As part of that, its recognised that Auckland desperately needs a decent cruise terminal for future visits beyound RWC2011. So one will be built there, on the spot where the eastern shed now sits. The western shed will probably be retained during the tournament to house revellers. But after that its to be demolshed and either replaced with a new structure (there is talk of a new performing arts theatre) or left open for a park. The whole “Party Central” thing is a just a bi-product for the month the tournament is on – lets be honest, its a pretty good spot. Again – only 60,000 people can go to the game. The rest may want to go somewhere else, a “meeting point” with other fans, this area will likely be it. You can guarantee your Mayor in the Capital will propose exactly the same thing, somewhere. @KLK no doubt you are right: there wil be many and varied future uses of Queens’s Wharf. But to dress up the justification as being needed for the World Cup is ridiculous in the extreme. If Auckland needs Queen’s Wharf for a cruise liner terminal why have they not done this aready? And do you really think that Auckland City will invest several millions in a perfoming arts complex when they have spent the last four years declining applications from a very real and viable proposal? and sure, our mayor will happily propose public screens for the World Cup but you can bet your bottom dollar they won’t cost anything near $80m to erect; you can be equally sure that central government won’t stump up a bean let alone $20m to make it happen. This is vote buying in the extreme. I’m guessing that Queen’s Wharf could effectively hold 800 people for the revellery of the World Cup – $10,000 each? so they can get pissed instead of watching it at home? or getting equally pissed at the viaduct basin 400m away? There is no – absoutely no – economic argument for doing this. It comes down to Auckland City being too weak willed to develop their prime waterfront into anything useful or publicly minded and a National Goverment belatedly fighting against Trevor Mallard’s (intelligent) decision not to build a stadium on the waterfront. Auckland is our biggest and most backward city. Auckland has more shoreline than any city in the world and yet it is resticted to some vague idea of commerce. They have no idea how to serve their ratepayers and their public. Why should the rest of the country stump up tens of millions of dollars so they can all get pissed together? This is late and lazy urban design and corrupt governance at both central and national levels. No. Its not bing dressed up for RWC2011, and thats not the reason for the purchase. The ACC has been trying to negotiate buying that pice of land for years. It just happens that the central govt was keen to chip in with 2011 in mind. Again, nothing is being “dressed up” for 2011. If anything, development will be restrained until after that event. The Wharf was owned by the Ports of Auckland – and independant entity. After years of refusals, they have agreed to sell. The ACC has wanted acces to those wharves for years, but they didn’t own them, and it wasn’t until the current financial problems around world exports and idle land that the PoA agreed to seel. Again, they are separete entities. Despite ACC’s best intentions, it never eventuated in a sale. So that ‘s why they “have they not done this already”. Do I think the ACC will invest millions in a performance theatre? No. But according to Cr Aaron Bhatnagar, its the local arts fraternity that is flushed with cash and wanting to spend their money on a site. And the site of the western shed in particular. When you consider that this has been a long term dream, and will be a long term project, and RWC2011 just a blip on the radar, your estimates of 800 people, $10,000 and whatever else for 1mth in 2011 are irrelevant. You lament Aucklands massive shoreline and lack of foresight but t looks like they are starting to get things togther ,from a waterfront perspective – purchasing a massive pice of waterfront land for long term public access, to coincide with even more massive tank farm development to the west . Not getting nervous that the Capital’s waterfromt will be lost in all of this are you? Oh – and as for “the rest of the country” chipping in for Auckland? Check out PT allocations to Wellington as opposed to Auckland in recent memory. Disgraceful. Robb – thanks for the corrections re who is running which matches and where. I screwed up there. And KLK. Some interesting comments there, although my gut reaction is that Honeywood is on the ball on that one. But what do you mean by “PT allocations” ? Are you referring to Public Transport? I hope not cos that would be ludicrous. There were some shocking figures a few years ago, like that the Gov paid $1 for the whole rail tracks in NZ except for Auckland. And then they paid a sep fee of $50 million or something just for tracks in Auckland. Rort. Big time. However- some more news on that Auckland Queens Wharf bid is in the NZ Herald today, where it says that the chief planners fom both the ARC and the ACC met with the NZIA “to discuss a process for a competition” -perhaps a two stage competition over 10-12 weeks. That’s the good news. The bad news is that they are planning to run the competition the same cocked up way they ran the comp for the Te Wero bridge in the Viaduct Basin. What a waste of everyone’s time and effort that was. Meanwhile, some architect called Barry Copeland has already released his version – a “giant verandah with a wave motif” in stretched fabric. Hmmm. Robb – I’m confused. Or perhaps you are. Wasn’t the Christchurch stadium finished about 5 years ago? The one they call Jade Stadium? Or is that different from Lancaster Park? But also – why isn’t Wellington hosting more than just a semi? Seeing as we actually have a working, completed stadium, and a fully functioning party zone at no cost to the tax payer, wouldn’t it make more sense for Wellington to play a bigger role?